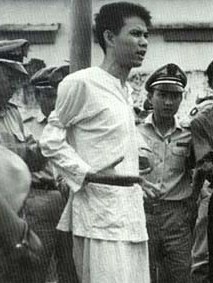 On this date in 1964, South Vietnam executed a 17-year-old Communist for a plot to assassinate American Secretary of Defense Robert McNamara. The young electrical worker and Viet Cong urban guerrilla Nguyen Van Troi was nabbed in the spring of 1963 trying to off both McNamara, famous for the megatonnage he would bestow on Southeast Asia, and U.S. ambassador Henry Cabot Lodge, Jr.
For the months leading up to his public shooting, he became an international cause celebre; North Vietnam would later milk his martyrdom with a postage stamp, an award, and numerous public streets. It is the Americans who have committed aggression on our country, it is they who have been killing our people with planes and bombs…. I have never acted against the will of my people. It is against the Americans that I have taken action. Naturally, he became a worldwide leftist martyr. There’s an Estadio Nguyen Van Troi in Cuba; American actor Troy Garity, son of Jane Fonda from her “Hanoi Jane” days, is also named for Nguyen Van Troi. Robert McNamara, meanwhile, had many, many years yet to live, and many, many more Vietnamese deaths to burden his conscience. Troi’s widow wrote a 1965 book about him, out of print but still available on the used book market. quiero q cosnte en este sitio.